Indian Hills General Improvement District's water system is a municipally owner water system serving approximately 5,627 residents through 1,791 residential and 74 commercial water service connections. The District has 1.6 million gallons (MG) of storage supplied by five storage tanks to adequately provide for peak water demand and fire storage. 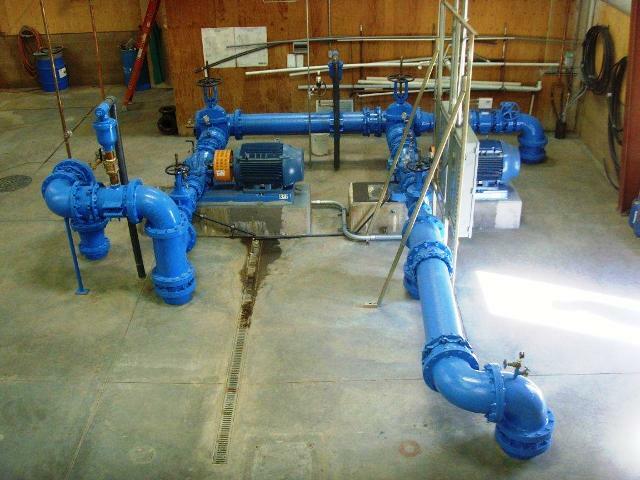 In the event of an emergency, the District is also interconnected through a metered inter-tie with Douglas County's North Valley Water System, which can bring an additional 2 MG of water storage on line if needed. Our water is primarily supplied through a recently constructed 18 inch water main from the Town of Minden. For information about the water quality for the water supplied to us, please visit www.townofminden.com and click on the water quality report or you can contact the Town of Minden at (775) 782-5976. In addition to the Minden water, the District is keeping in service, as needed, three wells with good quality water that can each produce approximately 100 gallons per minute (gpm). Indian Hills Sunridge Booster Station Reconstruction: After being in service for many years it came to the attention of the Indian Hills Water Operators that the Sunridge Booster Station (which services water to the North Sunridge Park and the homes above the park) was in need of replacement due to severely corroding pipes and pumps that had reached the end of their useful life. The new booster station is up and running and includes a large pump to provide fire flows and will provide operational flexibility during normal water usage. We often receive calls from residents asking to have their water turned off for various reasons. As it is the District’s responsibility to take care of this issue, this is exactly how we would like to handle this request. If a problem develops while turning off/on the water, our operators have the tools to minimize potential larger issues. The problem we are experiencing is residents taking it upon themselves to use the meter as a shutoff for their homes. If a break or leak should arise while turning off/on the meter, it could lead to having to shut down the entire street to repair the meter, with all of the costs associated with the repair being charged back to the resident. Therefore, we ask that you please not try to do this by yourselves. The meters out by the street are the property of the District, not the home owner. In the District's Water Service Policy under section 7, it states that "no person shall uncover, make any connection with or open into, use, alter, or disturb any public water facility or property. When it is evident that someone has tampered with a water meter, register or meter pit a $250.00 fine will be implemented." If you have a need to shut off the water, but want to do it yourself, then you need to locate your water shut-off at your house. This should be located right next to your house and usually on the same side of the house as the meter that’s located at the street. Depending on the age of your home, a shut-off valve would have been installed by code at the time of construction. Our operators are willing to come out and assist our residents in locating the general area of the shut-off valve, but they are not allowed to perform any work for liability reasons. Should you need to have one of these shut-off valves installed, you should contact a plumber. This method of shutting off your water is much more efficient in an emergency, and you don’t run the risk of possible damage to the meter and a possible street shut down. The most reliable way to determine where your house valve would most likely be, is to go under the house and see where the water line comes up from the foundation. The value would most likely be on the other side of the foundation outside the house. The valve box or operating rod may just be covered with dirt. Having a house shut off that works, and is accessible, will allow homeowners to be able to shut off their water quickly in the event of a plumbing leak. District personnel if called after hours could take as long as an hour, depending on weather and road conditions, to reach their house to shut off the water. The subsequent property damage could easily exceed the cost of hiring a plumber to install or repair the homeowners house shut off valve. At the July 17, 2013 Board meeting the Indian Hills GID Board of Trustees adopted to amend the Water Service Policy to implement service charges and a fine for tampering with a water meter, register or pit that would take effect when, a) a homeowner calls requesting the District to come out during business hours and it is determined to be due to the homeowners negligence or it is proved to be a nuisance a $30.00 charge should be implemented, b) any afterhours call that proves to be the responsibility of the homeowner and not that of the Indian Hills General Improvement District a $60.00 charge should be implemented or c) when it is evident that someone has tampered with a meter, register or meter pit which is the property of the District a $250.00 fine will be implemented. For Commercial Connection Fees, click on "Ordinances & Policies", click on "Policies" and select Commercial Sewer Service Policy and Commercial Water Service Policy. To set up a new water and sewer account, please select the appropriate form listed below or contact the main office at (775) 267-2805. Questions regarding billing or status on your current account, please contact the main office at (775) 267-2805. For your convenience, a payment drop box is located directly in front of the main office. Most lawns only need about 1" of water each week. During dry spells, you can stop watering altogether and the lawn will go brown and dormant. Once cooler weather arrives, the morning dew and rainfall will bring the lawn back to its usual vigor. This may result in a brown summer lawn, but it saves a lot of water. Early morning is generally better than dusk since it helps prevent the growth of fungus. Early watering, and late watering, also reduce water loss to evaporation. Watering early in the day is also the best defence against slugs and other garden pests. Try not to water when it's windy - wind can blow sprinklers off target and speed evaporation. The District takes six monthly bacteriological (Bac-T) samples as required by the NDEP Bureau of Safe Drinking Water. The number and location of these Bac-T samples are determined by the population served and the particular aspects of the District water distrubution system. All sample locations are approved by the NDEP. Other sampling for water quality of our wells is performed on a monthly, quarterly, annually or tri-annual basis as required by the NDEP. Think you may have a leak? Want to check for yourself. Here are several links which may be helpful. Try cleaning out the screens on your faucets first, especially if the flow problems are isolated to one or two fixtures and not common throughout the house. Check under the sink and make sure the supply line valves are all the way turned on. Check to see if the house valve is turned all the way on. This could be the cause if plumbing work was done recently or if the irrigation system was recently turned on or off. Many homes in the District are equipped with Pressure Reducing Valves (PRV). These mechanical, adjustable, direct acting valves are most often installed on the incoming water supply line under the house prior to any fixture supply lines. The PRV reduces the incoming water pressure by utilizing a spring loaded diaphragm which can be manually adjusted via a screw or nut mounted on the top of the bonnet of the valve. Re-build kits are available from plumbing supply companies if adjusting the operating screw does not work. Fixtures or Shower heads plugging up? If you are not comfortable doing this yourself, call a plumber. Are you having problems with your water heater spitting out water? Are you noticing high pressure in your house plumbing? The water meters in the District are equipped with check valves. This means that all residential water connections are CLOSED systems. Which means that water from the residence will not travel back into the water mains, the water will only flow into the residence. When water is heated, it will EXPAND, causing higher pressure in your water heater. This is called THERMAL EXPANSION and can be very damaging to your water heater and home plumbing fixtures. SInce the residential water system is CLOSED, the pressure has nowhere to escape to and will continue to build up until it opens the P & T Valve, dumping water onto your garage floor or wherever the drain line may empty to. This problem can be fixed economically with the installation of an EXPANSION TANK. Of course if you are not comfortable with doing this yourself, call a plumber. The above are all examples of the more common questions asked by our residents. We hope the links provided prove to be helpful. Should you have any other questions or concerns please call the office at (775) 267-2805 or the Hobo Water Plant at (775) 267-9860. We remind you that the ordinance regarding outside watering in the Indian Hills General Improvement District is in effect year around. This ordinance was adopted to eliminate the wasting of water and is mandated by the State of Nevada. We also ask that you use common sense and be prudent when you do water, and practice water conservation in your entire household. Your cooperation and care in this matter is greatly appreciated and will help ensure that we will have an abundant water supply in the future. 12:00 NOON and 4:00 P.M. EXEMPTIONS: Commercial gardeners or caretakers, flowers and vegetable gardens and lawns less than 30-days old. WASTE OF ANY KIND: Such as allowing water to run down gutters, into the street, alley or sidewalk, is PROHIBITED AT ALL TIMES.